Clean Up City of St. Augustine, Florida: BEACH PARKING NIGHTMARE: 8803 Square Ft. Restaurant, with only 59 parking spaces at former PANAMA HATTIE'S? -- Developer Lambros Kokkinelis Investments LLC's DEMAND Must be DENIED/MODIFIED. (Tuesday, April 17, 2018 meeting at 7 pm). BEACH PARKING NIGHTMARE: 8803 Square Ft. Restaurant, with only 59 parking spaces at former PANAMA HATTIE'S? -- Developer Lambros Kokkinelis Investments LLC's DEMAND Must be DENIED/MODIFIED. (Tuesday, April 17, 2018 meeting at 7 pm). The St. Augustine Beach Planning and Zoning Board's agenda for next week includes the new building at the former Panama Hatties site. Plans show a MASSIVE restaurant, nearly 9000sf, which is twice the size needed for a full-service restaurant w/full SRX liquor license. Experts agree it will have capacity for about 250-300 people- maybe more. It is providing 59 parking spaces. Not enough. This would exacerbate St. Augustine Beach's recurrent parking nightmare, in an area where there is already a parking nightmare. While it would be great to have authentic Greek fare on Beach Blvd one again, LAMBROS KOKKINELIS INVESTMENTS LLC needs much more parking. What: Kokkinelis is creator and founder of the Fort Lauderdale-based Greek fast food restaurant chain, Gyroville. In addition to traditional Mediterranean Greek classic dishes like falafel, baklava and gyros, Gyroville serves "Greek fusion" such as grilled Cajun mahi mahi and grilled chicken souvlaki with barbeque sauce at its Fort Lauderdale, Pembroke Pines and Boca Raton locations. While Gyroville's menu items brand the restaurant's core Greek concept, Kokkinelis has extended the fusion concept: it's part diner and part fast food operation. Consumers go to an order window and walk the line to build their own pita. They seat themselves. Price points are a compromise of fast food and diner price ranges. Kokkinelis is an established restaurateur in the area. He owns several outlets, including The Moonlite Diner in Fort Lauderdale and Hollywood, and Diner 24 in Oakland Park. The experience gives him the opportunity to interact with a broad demographic. Kokkinelis felt confident his loyal customers would support a new concept based on ethnic fast food. "I've been watching the fast casual sector and felt that Greek fast food was not a crowded segment," he said. 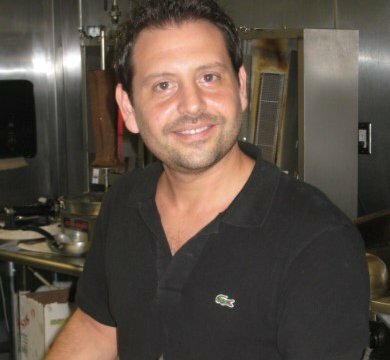 The back story: As the son of a Greek immigrant, Kokkinelis became immersed in the family business working at his father's diner beginning when he was 12 years old. "A diner gives you the best culinary training you'll ever have. You hit all dining hours from the Bentley customer to the bum," said Kokkinelis. "I was a diner boy." As he developed his own career, Kokkinelis eventually moved away from the mom-and-pop concept. He saved his money, went to culinary school, participated in internships and ran free-standing food kiosks in Manhattan. "This is a hard business," said Kokkinelis. "There is some glamour, but mostly it's about hard work." The take away: Being a business owner is hard work and good luck, says Kokkinelis. "It's risky. Like anything else, you have to be strategic. When you have a lot to lose, it can bring out the best in you." Create your team. Whether you borrow or self fund, a lot of work goes into getting the business up and running: from the cup, the line, the container, to technology, people and information, says Kokkinelis. Hire consultants who understand the financial aspects and real estate. "Get everyone on the bus and get them in the right seats. I would not be able to be where I am without extraordinary help," said Kokkinelis. Build on your accomplishments, use your knowledge. Kokkinelis has advantages, because his success is proven, he says. "I have business units, the power of credit and experience behind me," he said. He has options because of his sustainability and strategic planning. For example, he chooses Gyroville sites based on vibrant marketplaces that bring in customers. He selects stores with smaller footprints designed for high volume so he can minimize costs and create affordable price points.